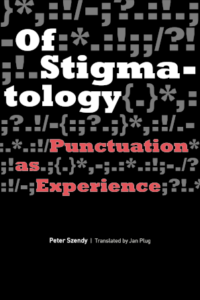 Through the ample examples of film, literature, philosophy, and even medicine, Of Stigmatology imaginatively follows of the various ways in which punctuation both punctures and sutures language. Addressing all kinds of punctuating effects as a technology of meaning, author Peter Szendy studies the repertory of punctuation marks in all their arrangements and all their combinations, including the most complex or contradictory ones, and even in their so-called pure or absolute usages, isolated, without either words or phrases that carry them. once calls for and traces. Very excellent info can be found on blog. Follow us on Pinterest to see our latest books and collections!